Putin’s presidency marks a period of relative political stability that has no doubt contributed to the strong economic progress since the crisis. The oft-recited wisdom that economic well-being requires a strong and credible government has never been as forcefully demonstrated as in Russia during the past few years. Russia’s economic rebound under Putin has been both faster and stronger than anyone could have predicted in the wake of the 1998 banking crisis. The gross domestic product rose 5.4, 9, 5, 4.3, 6.6, and 7.3 percent over the 1999, 2000, 2001, 2002, and 2003 periods, respectively. Russia’s industrial production grew by 11, 11.9, 4.9, 3.7, 6.7, and 7 percent over the same time. After several years of solid growth the Russian economy is at new heights, international reserves are at record levels, foreign debt is being repaid early, and Russia is again able to tap international financial markets, if it wishes to do so. 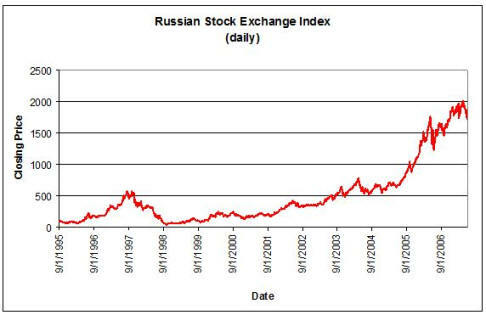 Expectations are once more on the rise and the Russia equity market is again a top performer in the world. True, much of this recovery has been due to the oil price rise and the collapse in imports from August 1998. But the rapid rise in revenues from exports of oil and gas cannot alone explain the rapidity with which the Russian economy had turned around from its earlier years of shrinkage to an unmistakable tendency to growth. The recovery had deeper economic reasons and meant that Russia was at last beginning to reap some return from the substantial structural reforms it had actually undertaken. Best enterprises in various industries dashed ahead, stimulating significant growth not only in oil and gas extraction but also in industries involved in intermediary goods production and manufacturing, including chemicals, light manufacturing, pulp and paper, and machine building. All these changes should give greater prominence to a new group of Russian entrepreneurs and small business owners, as well as magnates. They are mainly manufacturers who are interested in production for the market rather than sheer redistribution of the former Soviet state assets. They are getting weary of the leaden bureaucracy, corruption, illegality, and even violence that pervade Russia’s business practices, and they rally to Putin’s flag of restoring order to the anarchic business sector. They are interested in a transparent legal system and a sound banking system and will demand these reforms as Russia moves to the next stage of growth. In short, they are Putin’s natural allies in his efforts to transform Russia’s murky business environment and put the economy on a sustainable growth path. PREVIOUS GO TO "FIRST & SECOND DUMAS"